Tallinn is the caipital an the lairgest ceety in Estonie. It is situatit on the northren coast o the kintra, on the banks o the Gulf o Finland, 80 km (50 mi) sooth o Helsinki, wast o Saunt Petersburg. In 1154 a toun cried Qlwn or Qalaven (possible derivations of Kalevan or Kolyvan) wis put on the warld cairt o the Almoravid bi cartographer Muhammad al-Idrisi who describit it as a sma toun like a lairge castle amang the touns o Astlanda. It haes been suggestit that the Quwri in Astlanda mey hae denotit the predecessor toun o the day's Tallinn. The earliest names o Tallinn include Kolyvan (Roushie: Колывань) kent frae East Slavic chronicles, the name possibly derivin frae the Estonian mythical hero Kalev. Up tae the 13t century the Scandinavians an Henry o Livonie in his chronicle cried the toun Lindanisa: Lyndanisse in Dens, Lindanäs in Swadish, an aa mentioned as Ledenets in Auld East Slavic. Accordin tae some theories the name derived frae meethical Linda, the wife o Kalev an the mither o Kalevipoeg. who in an Estonian legend carried rocks tae her husband's grave that formed the Toompea hill. It haes been an aa suggestit that in the context the meanin o linda in the airchaic Estonian leid, that is seemilar tae lidna in Votic, haed the same meanin as linna or linn later on meanin a castle or toun in Inglis. Accordin tae the suggestion nisa wad hae haed the same meanin as niemi (meanin peninsula in Inglis) in an auld Finnish form o the name Kesoniemi. Ither than Kesoniemi kent auncient historical names o Tallinn in Finnish include Rääveli. The Icelandic Njal's Saga mentions Tallinn an caws it Rafala, which is a variant o the name Raphael. Efter the Dens conquest in 1219 the toun became kent in the German, Swadish an Dens leids as Reval (Laitin: Revalia). The name oreeginatit frae (Laitin) Revelia (Estonian) Revala or Rävala, the adjacent auncient name o the surroonding Estonian coonty. The oreegin o the name "Tallinn(a)" is certaint tae be Estonian, awtho the oreeginal meanin o the name is debatit. It is uisually thocht tae be derived frae "Taani-linn(a)" (meanin "Dens-castle/toun"; Laitin: Castrum Danorum) efter the Danes biggit the castle in place o the Estonian stranghauld at Lindanisse. Housomeivver, it coud an aa hae come frae "tali-linna" ("winter-castle/toun"), or "talu-linna" ("hoose/farmstead-castle/toun"). The element -linna, lik Germanic -burg an Slavic -grad / -gorod, oreeginally meant "fortress" but is uised as a suffix in the formation o toun names. The previously uised offeecial German name Reval (help·info) (Roushie: Ревель) wis replaced efter Estonie became independent in 1918–1920. At first baith forms Tallinna an Tallinn wur uised. The United States Board on Geographic Names adoptit the form Tallinn atween Juin 1923 an Juin 1927. The form Tallinna appearin in modren times in Estonian denotes the genitive case o the name, as in Tallinna Reisisadam (Port o Tallinn). Ither variations o modren spellins include Tallinna in Finnish an Таллин in Roushie. A form Tallin derivin frae the Romanization o Roushie spellin o the name Таллин  wis uised internaitionally an aw durin the era Estonie wis annexed bi the Soviet Union. The first traces o human dounset foond in Tallinn's ceety centre bi aircheologists are aboot 5000 years auld. The comb ceramic pottery foond on the steid dates tae aboot 3000 BC an corded ware pottery c. 2500 BC. In 1050 the first fortress wis biggit on Tallinn Toompea. As an important port for tred atween Roushie an Scandinavie, it became a target for the expansion o the Teutonic Knichts an the Kinrick o Denmark durin the period o Northren Crusades in the beginnin o the 13t century whan Christianity wis forcibly imposed on the local population. Dens rule o Tallinn an Northren Estonie stairtit in 1219. In 1285 the ceety, then kent as Reval, became the northmaist member o the Hanseatic League – a mercantile an militar alliance o German-dominatit ceeties in Northren Europe. The Danes sauld Reval alang wi thair ither laund possessions in northren Estonie tae the Teutonic Knichts in 1346. Medieval Reval enjoyed a strategic poseetion at the crossroads o tred atween Wastren an Northren Europe an Roushie. The ceety, wi a population o 8,000, wis vera well fortifee'd wi ceety waws an 66 defence touers. A wather vane, the figur o a auld warrior cried Auld Thomas, wis put on tap o the spire o the Tallinn Toun Haw in 1530 that became the seembol for the ceety. Wi the stairt o the Protestant Reformation the German influence became even stranger as the ceety wis convertit tae Lutheranism. In 1561 Reval poleetically became a dominion o Swaden. Durin the Great Northren War, plague stricken Tallinn alang wi Swadish Estonie an Livonie capitulatit tae Imperial Roushie in 1710, but the local sel-govrenment institutions (Magistracy o Reval an Chivalry o Estonie) retained thair cultural an economical autonomy athin Imperial Roushie as the Duchy o Estonie. The Magistracy o Reval wis abolisht in 1889. The 19t century brocht industrialization o the ceety an the port kept its importance. Durin the last decades o the century Roushification measurs became stranger. The auldest fitbaa club in Estonie, Meteor Tallinn wis foondit in 1908 in the destrict Lasnamäe. On 24 Februar 1918, the Independence Manifesto wis proclaimed in Reval, suin tae be Tallinn, follaeed bi Imperial German occupation an a war o unthirldom wi Roushie. On 2 Februar 1920, the Tartu Peace Treaty wis signed wi Soviet Roushie, whaurin Roushie acknawledgit the unthirldom o the Estonie Republic. Tallinn became the caipital o a unthirlt Estonie. Efter Warld War II stairtit, Estonie wis annexed bi the Soviet Union (USSR) in 1940, an later occupee'd bi Nazi Germany frae 1941 tae 1944. Efter the Nazi retreat in 1944, it wis again annexed bi the USSR. Efter annexation intae the Soviet Union, Tallinn became the caipital o the Estonie SSR. Durin the 1980 Simmer Olympics, the sailin (then kent as yachtin) events wur held at Pirita, north-east o central Tallinn. Mony biggins, sic as the "Olümpia" hotel, the new Main Post Office biggin, an the Regatta Center, wur biggit for the Olympics. In August 1991 an independent democratic Estonian state wis re-established and a period of quick development tae a modren European caipital ensued. Tallinn became the caipital o a de facto independent kintra ance again on 20 August 1991. The Toompea (Domberg) or "Cathedral Hill", which wis the seat o the central authority: first the Dens captains, then the komturs o the Teutonic Order, an Swadish an Roushie govrenors. It wis till 1877 a separate toun (Dom zu Reval), the residence o the aristocracy; it is the day the seat o the Estonie pairlament, govrenment an some embassies an residencies. The Auld Toun, which is the auld Hanseatic toun, the "ceety o the ceetizens", wis no admeenistratively unitit wi Cathedral Hill till the late 19t century. It wis the centre o the medieval tred on which it grew prosperous. The Estonie toun forms a crescent tae the sooth o the Auld Toun, whaur the Estonies came tae settle. It wis no till the mid-19t century that ethnic Estonies replacit the local Baltic Germans as the majority amang the residents o Tallinn. 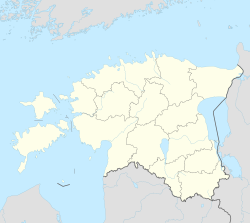 The ceety o Tallinn haes niver been razit an pillagit; that wis the fate o Tartu, the varsity toun 200 km (124 mi) sooth, which wis pillagit in 1397 bi the Teutonic Order. Aroond 1524 Catholic kirks in mony touns in Estonie, includin Tallinn, war pillaged as pairt o the Reformational fervor: this occurred throuoot Europe. Awtho extensively bombed bi Soviet air forces durin the later stages o Warld War II, hintle o the medieval Auld Toun still retains its chairm. The Tallinn Auld Toun (includin Toompea) became a UNESCO Warld Cultural Heritage steid in 1997. At the end o the 15t century a new 159 m (521.65 ft) heich Gothic spire wis biggit for St. Olaf's Kirk. atween 1549 an 1625 it wis the tawest biggin in the warld. Efter several fires an follaein rebiggin, its owerall hicht is nou 123 m (403.54 ft). For local govrenment purposes, Tallinn is subdividit intae 8 admeenistrative destricts (Estonie: linnaosad, singular linnaosa). The destrict governments are ceety institutions that fulfill, in the territory o thair destrict, the functions assigned tae thaiem biy Tallinn legislation an statutes. Each destrict govrenment is managit bi an Elder (Estonie: linnaosavanem). He or she is appointit bi the Ceety Govrenment on the nomination o the Mayor an efter haein heard the opinion o the Admeenistrative Cooncils. The function o the Admeenistrative Cooncils is tae recommend, tae the Ceety Govrenment an Commissions o the Ceety Cooncil, hou the destricts shoud be admeenistered. ↑ "Total population in Urban Audit cities". European Commission. 14 June 2013. Retrieved 29 September 2013. ↑ 4.0 4.1 Ertl, Alan (2008). Toward an Understanding of Europe. Universal-Publishers. p. 381. ISBN 978-1-59942-983-0. ↑ Birnbaum, Stephen (1992). Birnbaum's Eastern Europe. Harper Perennial. ISBN 9780062780195. ↑ Fasman, Jon (2006). The Geographer's Library. Penguin. p. 17. ISBN 9780143036623. ↑ Terras, Victor (1990). Handbook of Russian Literature. Yale University Press. p. 68. ISBN 9780300048681. ↑ The Esthonian Review. University of California. ↑ Wieczynski, Joseph (1976). The Modern Encyclopedia of Russian and Soviet History. Academic International Press. p. 230. ISBN 9780875690643. ↑ Ransome, Arthur (1923). "Racundra's" First Cruise. B.W. Huebsc. ↑ Young, Jekaterina (1990). Russian at Your Fingertips. Routledge. p. 100. ISBN 0415029309. This page wis last eeditit on 21 Julie 2018, at 06:16.